Last week Steve Jobs called a press conference and said that it would be giving away free cases to iPhone 4 users due to the antenna issues. Jobs said that the antenna issue is not unique to the iPhone and can be replicated on other smartphones as well. However, in an effort to keep its customers happy, Apple has launched the iPhone 4 Case Program that will allow customers to get a free case for their iPhone 4. Getting your free case is simple. 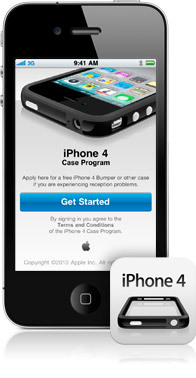 All you need to do is download the iPhone 4 Case Program app. From there it will allow you to log into your iTunes account and choose a free case from a selection of Incase cases, Belkin cases, Speck cases, or a black Apple bumper. If you made your iPhone 4 purchase before July 23rd, you must choose a case no later than August 22nd. If the iPhone 4 was purchased after July 23rd, you have 30 days from the iPhone purchase. The program will also not be valid for iPhones purchased after September 30th. If you’ve already purchased a Apple bumper, the company said it will refund you the full price of the bumper. If you used a credit card, it will automatically be refunded. If you used cash you need to go into your local Apple store. This antenna problem is very ridiculous especially when happened to a company like Apple.